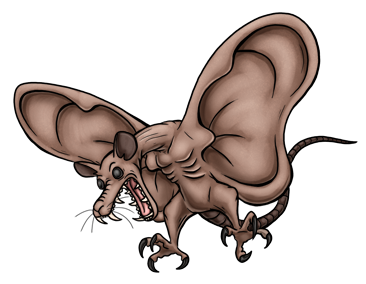 This nightmarish predatory Kreature was designed for nocturnal reconnaissance missions. Not only is it an agile flyer with quick reflexes, but thanks to its keen hearing it can pinpoint prey while blindfolded and avoid attacks that it can't even see coming. It can emit a ray of concentrated ultrasonic sound waves from its mouth, penetrating its target with concussive ultra high frequency vibrations. It carries its babies in a pouch on its abdomen until they're ready to fly. It prefers to sleep during the day, hanging upside down from tree branches with its prehensile tail.